Pinedale 2005 Turkey Trot Kristin Corwin and Andi Noble dress up as turkeys for the 2005 Pinedale Turkey Trot. Photo courtesy Craig Sheppard. (Pinedale) The 15th running of the Pinedale Turkey Trot 5000 was greeted by the most gorgeous Wyoming morning that you could imagine. Start time temperature was 17 degrees with no wind and a totally sunny sky. The course was free from ice, snow, moose and anything that could make the 3-mile path treacherous. However, there were two turkeys on the course. Kristin Corwin and Andi Noble dressed up as turkeys and ran the course in a remarkable 31:12. That time is pretty impressive giving the costumes they had on. 120 participants (a new record and we didn’t even count the dogs) came from a six-state area (Louisiana, Colorado, Idaho, Nevada, Utah and Wyoming) to partake in this Pinedale Thanksgiving tradition. This in now an international event, for we had a participant (Michelle Brown) from Canada by the way of UW. Cory Williams was the first to finish the race. He came in at 14:30 riding his bike. The male running division was once again won by Ken Konicek in a time of 20:32. Rounding out the mature male running division were Kirk Thomas in 21:38 and Martin Hudson (and Pete) at 23:21. The younger adult male running division was won by Scott Carpenter (20:57). He came in second overall to Ken Konicek. Second and third place in this division were Scott Corwin (23:50) and Matt McDaniel (26:14). The high school boys running division was led by Travis Hines (22:42) and Jeremy Silvey (22:44). The youngest boys division was once again led by Lucas Corwin (30:10) followed by Rodney Carter (35:54) of Rock Springs and Connor Kingsbury (35:59). The women’s running division was won by Laura Vasquez, in her first ever Pinedale Turkey Trot. She probably thinks it is always this nice for running on Thanksgiving morning. Her time was 24:01. She was followed by Suzy Kingsbury (24:55) and Turkey Trot original member Terry Cain (25:59). The younger female runners were led by Pinedale newcomer Katie Isacksen (25:45), high schooler Meredith Noble (26:12) and Canadian Michelle Brown (27:16). The walking division winner is harder to determine, for there are a lot of run/walkers. This year’s pure walking division was won by Karen Stewart (41:57) and the male pure walking division was Turkey Trot original member Dale Hill (44:37). The youngest turkey trotter was Wyatt Becker (4 months) carried by his mother Carrie. Race Director and founder of the turkey trot, Craig Sheppard, walked the course after everyone left. We won’t talk about his time, but he was a “good boy” and walked every step. But he promises to be back on the running track by next year. There were numerous families participating as a group and many more participants that I can’t mention here, but a big thanks goes out to all who get together on this special day to exercise, compete and socialize. 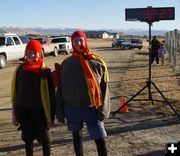 Don’t forget it is not too late to get in shape for the Pinedale Turkey Trot 5000. It will be happening again next Thanksgiving at 9AM at the Sheppard’s house.